This is the third in a series of articles about the basics of developing SharePoint-hosted SharePoint Add-ins. You should first be familiar with SharePoint Add-ins and the previous articles in this series, which you can find at Get started creating SharePoint-hosted SharePoint Add-ins. 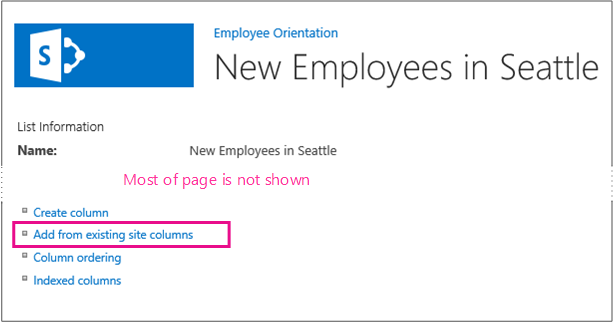 In this article, we get back to coding by adding some site columns to the Employee Orientation SharePoint Add-in. In Solution Explorer, right-click the project and select Add > New Folder. Name the folder Site Columns. Select Site Column, give it the name Division, and then select Add. In the elements.xml file for the new site column, edit the Field element so that it has the attributes and values shown in the following example, except that you should not change the GUID for the ID attribute from the value that Visual Studio generated for it, so be careful if you are using copy-and-paste. Description="The division of the company where the employee works." Add another Site Column named OrientationStage to the same folder . In the elements.xml file for the new site column, edit the Field element so that it has the attributes and values shown in the following example, except that you should not change the GUID for the ID attribute from the value that Visual Studio generated for it. Because this is a Choice field, you must specify the possible choices and the order in which they should appear in the drop-down list when a user is making a choice. Because it is a required field, you must specify a default value. Add the following child markup to the Field element, and then save all the files. Select the callout button, · · · just above the list, and then select Create View. The View Type page opens, with the breadcrumb structure Settings > View Type near the top. Select the Settings breadcrumb. On the Settings page, open the Add from existing site columns link on the left about halfway down the page. On the Add Columns from Site Columns page, select Employee Orientation on the Select site columns from drop-down list. Add the Division and OrientationStage columns to the Columns to add box. Select OK to return to the Settings page, and then select the New Employees in Seattle breadcrumb near the top of the page. You will work with this add-in and Visual Studio solution in other articles, and it's a good practice to retract the add-in one last time when you are done working with it for a while. Right-click the project in Solution Explorer, and then select Retract. You don't really want your users to have to manually add the custom columns to the list, so in the next article in this series, you'll create a custom content type that includes the custom columns and is automatically associated with the New Employees list template: Add a custom content type to a SharePoint-hosted SharePoint Add-in.